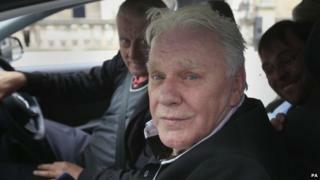 Comedian Freddie Starr is claiming damages from a woman who says he groped her when she was 15. The 72-year-old attended London's High Court on Monday at the start of a two-week slander and libel trial where he faced his accuser, Karin Ward, 56. Mr Starr, of Studley, Warwickshire, is suing her after she said he assaulted her at a Jimmy Savile show in 1974. Ms Ward denies the damages claims against her and relies on the defences of justification and public interest. Mr Starr is suing over interviews given to the BBC and ITV in October 2012, statements on a website and those made in an eBook about Ms Ward's life. He claims he has lost £300,000 because of shows cancelled as a result of the allegations. He said the police undertook a full investigation into the allegation made by Ms Ward and a further 13 additional complainants who also put forward allegations. The Crown Prosecution Service decided that no charges would be brought. Mr Starr told the judge Mr Justice Nicol, who is hearing the case without a jury, that he did not initially recall appearing on Clunk Click in March 1974. However, footage emerged which showed him in the studio, with Ms Ward in the audience behind him. During the hearing he rejected the allegation that he had groped the teenager in Savile's dressing-room. He said: "It just never happened. It was not in my moral compass. My moral compass will not allow me to do that." He also said had never groped anyone and denied having "wandering hands". The father-of-five also denied Ms Ward's claim that he smelt of alcohol which frightened her, saying he had never drank. As well as the financial loss, he had suffered loss to his reputation and damage to his health and family life, the court heard. "I had been recovering very well from heart surgery up until the allegations were made," Mr Starr said. "The stress and embarrassment of the false accusations have contributed significantly to a decline in my health. I have had suicidal thoughts." Ms Ward's advocate, David Price QC, dismissed the evidence of another 15-year-old girl as "garbage". He also dismissed as "fiction and lies" a claim by a third 15-year-old girl who attended the show that he had engaged her in a "passionate French kiss". Mr Starr said that Ms Ward and the other two women who made allegations about him, who all attended Duncroft Approved School at the time, had stayed in touch over 40 years. He added: "They all went to the same school, wore the same school tie and they are all telling lies, and that's the truth of the matter. This whole thing is ridiculous." Mr Starr has finished giving his evidence and the hearing was adjourned until Tuesday.